We had a fantastic time at the Garrison Institute as we celebrated our farmers, our shoppers, and 16 years of a shared mission to support agriculture in the Hudson Valley. A seasonal and local menu was served, featuring produce from our farmers and created by Fresh Company . Ticket included dinner and cocktails. $55 of the purchase price is a tax-deductible donation. Ticket included dinner and cocktails + $50 donation to CSFM as a 2018 Seed Friend of the Cold Spring Farmers’ Market. $105 of the purchase price is a tax-deductible donation. 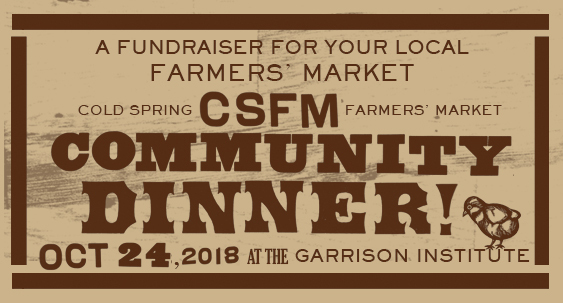 Ticket included dinner and cocktails + $125 donation to CSFM as a 2018 Harvest Friend of the Cold Spring Farmers’ Market. $180 of the purchase price is a tax-deductible donation. Ticket included dinner and cocktails + $255 donation to CSFM as a 2018 Dinner Sponsor. Includes Membership as a 2018 Harvest Friend of the Cold Spring Farmers’ Market. $310 of the purchase price is a tax-deductible donation.